BBa_K2656009 is the BBa_B0030 RBS standardized into the Golden Braid assembly method. Thus, it is strong ribosome binding site compatible both with the BioBrick and Golden Gate grammar. It also includes the BioBrick equivalent scar in the 3' extreme, so the insertion of this supplementary bases ensure correct spacing for the CDS expression when assembled into a TU. Table 1. 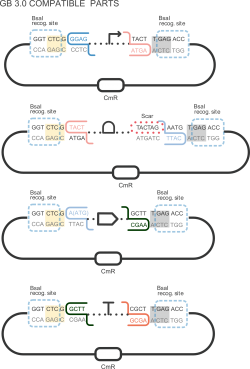 Optimized parameters for the BBa_K2656009 RBS Experiment 1. Table 1. Optimized parameters for the BBa_K2656009 RBS Experiment 2.